If you’re looking to reduce the amount of sugar in your diet, we’ve got a wonderfully sweet, non-glycemic frosting recipe. Mix ingredients with hand mixer medium speed for 2 minutes. 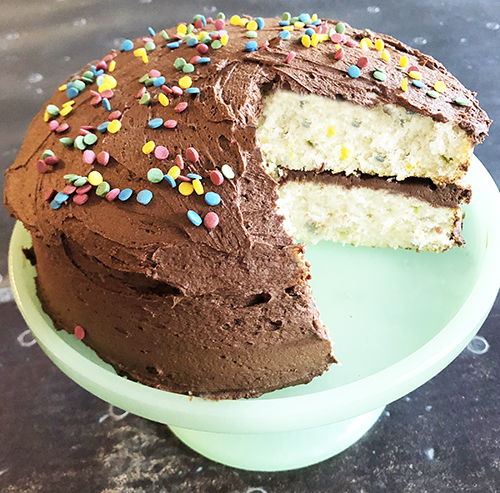 Try with our Gluten-free Confetti Cake Mix. We saved ½ the confetti packet to top the cake! Jazz up any dessert by decorating with colorful coconut sprinkles! Each packet contains 1 ½ tsp color. 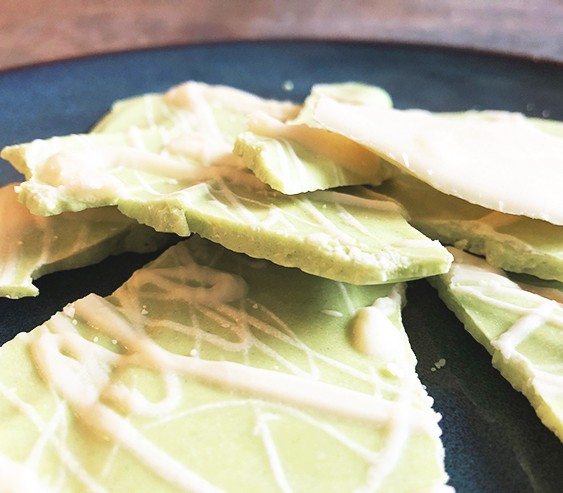 Minty chocolate bark can be used as a topping for your favorite ice cream, cookies, or cakes, or melted into warm hot cocoa. Yum! 1. Over double boiler melt chocolate. 2. Add peppermint oil and stir. 4. Separate half of melted chocolate into a bowl. 5. Add in green color and stir until fully blended. 6. Pour colored chocolate over a sheet of tinfoil or parchment paper. Put in refrigerator 5 minutes. 7. Drizzle remaining white chocolate over cooled green. 8. Once all the chocolate is completely cooled, break into pieces. Add a dollop of natural color to your favorite dessert, from pie to ice cream, or even pancakes! Homemade whipped cream is easy and takes just a few minutes. 1. Chill a medium-sized bowl in the freezer for at least 10 minutes. 2. Blend dry ingredients: powdered sugar and ColorKitchen color packet. 3. Add heavy cream and vanilla extract. 4. Beat with an electric mixer on high speed until stiff peaks form. 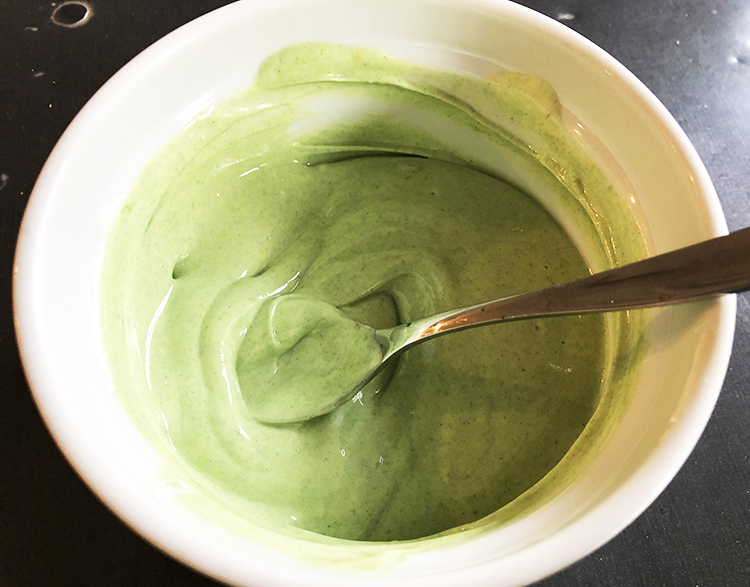 This simple vegan frosting recipe tastes delicious. Top with some fresh lavender or berries to make your cupcakes extra special. In a blender or food processor combine coconut butter, agave or maple syrup, and vanilla. Blend on high speed until smooth. Add water 1 tablespoon at a time until icing achieves your desired consistency. Blend in color packet at high speed until fully mixed. Use immediately or refrigerate for up to 2 weeks. In small bowl mix 1 packet of color with ½ Tbsp water. Stir until all color is dissolved. Set aside. Melt butter in a saucepan over low heat. Stir in sugar and vanilla. Add 1Tbsp water. Whisk until smooth and consistency of a thick syrup. Allow to cool for a minute. Slowly stir in color mixture and blend. Drizzle over cooled cake or dip donuts.